Beautifully finished, great looking speakers. I read tons of audio manufacturer's ads and literature. Most likely you do, too. When sifting through their claims of their equipment's supposed supremacy, it is tempting to take these declarations with a grain of salt – I mean, what would our systems sound like if everything in every ad or page of promotional literature were true? Wouldn't that be nice! So, when I'm sent a piece of equipment for review an instinctive hype-to-reality translator automatically kicks in. But then I'll quickly recall that we're talking about high-end audio equipment here – and the large majority of these manufacturers are small companies, boutique manufactures if you will, where their passions have produced goods that at their best merge the science of acoustics and electronics with the art of music. They are very proud of their products, and they are competing with many others for the pleasure of us owning said equipment. Even if the high-end manufacturer has multinational corporate backing, they are also helping us lowly audiophiles search for the holy grail of reproducing the facsimile of live music in our homes. But to get back to the small companies, in many cases it gets personal – these goods are sometimes the work of people who have given up their "day jobs" to produce what will hopefully change the life of a music lover for the better, and at the same time provide dream jobs for the production team. So I take pleasure in announcing to the world that what Salk Sound states in their literature regarding their HT1-TL speakers is free of hyperbole, and relates the passion that Jim Salk has for the reproduction of music via the speakers that bear his name. On their website it says that the Salk Sound HT10TLs have a "wide dispersion to extend the soundstage far beyond the dimensions of the speakers." This is true. And also true is that they have "an "airy," transparent, but never harsh, high end" and "a highly articulate, detailed and musical midrange". The HT-TL1's "seamless soundstage with no audible anomalies as sound moves from speaker to speaker" and has "wide dynamic capabilities to accurately and effortlessly handle elevated sound pressure levels" are also right on target. The overall tone of the website is one of pride that Jim Salk has for his products, and it also stresses that each speaker is constructed once they receive an order for each pair of speakers. Of course I have a job to do as an audio reviewer and investigate the speakers' sound further than a simple web page blurbs can or should. But before I get to into the sound of these speakers, one should realize that Salk Sound speakers are only available factory-direct. There are surely some disadvantages to ordering a speaker without a showroom audition, but Salk correctly explains that selling the speakers this way does away with dealer markup, which most of the times is not an insubstantial amount. Also, Salk Sound does not publish any print advertisements that the customer invariably pays for in further pushing up the final retail price of a pair of speakers. When I receive some products for review, occasionally I'm not that aware of their price, or in the case of the HT-1TLs, I simply forgot because I was considering many different speakers in not only their line, but some others that I read about in many of Enjoy the Music.com's show reports. I didn't re-visit Salk's website until the speakers were set up in the listening room. 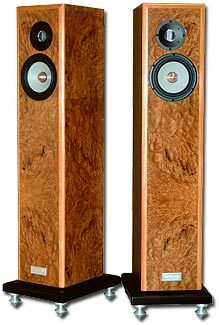 If I were to guess from their exquisitely polished cabinet with fit and finish that could easily compare to the best speakers available, combined with the protruding copper dust cap on the Seas mid/bass driver, not to mention their ribbon tweeter, I assumed the speakers would be priced somewhere around six thousand dollars. I was only off by 100%. The retail price of the Salk Sound HT1-TL is $2995 with a choice of either black satin, curly maple, curly cherry, curly walnut, mahogany, or oak veneers. For an extra two hundred dollars, plus the cost of veneer and hardwoods used, you can have the speakers' cabinets done up in a custom veneer agreed upon by you and Mr. Salk himself. There are also other options that were not applied to the review sample, such as the crossovers fitted with Sonicap platinum bypass capacitors that can be had for an extra $400, or an outboard passive crossover for $600. There are a bunch of cosmetic options including having the front end trim and/or front baffles and plinths of the speakers finished in solid wood that starts at an added $200 each, and if you want they can make the speakers out of bamboo for an additional $300. For no charge they will apply high-gloss sheen to a standard finish, but for an extra $1500 they'll apply a hand-rubbed, labor intensive, high-gloss piano lacquer finish to the speakers. But other than the crossover options, no matter how much one spends on how the speakers look, it isn't likely to improve the final sound very much, if at all. Personally, I'd choose sound quality over a handsome cabinet. But of course having both is nice. Thankfully, the Salk's 1-inch MDF (Medium Density Fiberboard) cabinet with a separate 0.5-inch MDF front baffle over the drivers in the upper portion of the cabinet was, as Salk claims on their website, very inert sounding. A stethoscope applied to the cabinet while playing sweeping test tones proved that the cabinets walls will add little, if anything at all, to the sound of the speakers. This is pretty amazing for a transmission line design where the sound of the woofer snakes through the length of the cabinet and back up again before being thrust out into the air. The HT1-TL features a LCY "pure" ribbon tweeter, and the 7-inch mid/bass driver is a Seas Excel W18, with its low mass magnesium-coned driver, and the crossover is designed by Dennis Murphy, who I know little if anything about, and little details are given about the crossover's construction itself only that Salk claims that they are constructed with "top-tier components". Four large spikes are provided that screw into a thick plinth, and the plinth is in turn attached by four large screws to the bottom of the speaker cabinet. Since the plinth is painted black regardless of the finish of the speakers it tended to stand out in my listening room, that is, it seemed as if it was an aftermarket add-on to the speakers. One might feel differently about how this looks in their own listening room, but the bottom plinth seemed to distract from the overall refinement of the speakers. I have no doubt that the stabilizing effect of the plinth/spike assembly added to the overall sound quality of the speakers. And I also have no doubt that it might be worth it to spring for the option of finishing the plinth with the same veneer of the main cabinet. But I'm making more of this than these speakers deserve, because I got quickly got used to the way they looked. The Salk Sound HT1-TLs were set up in my second system in a common space on the first floor of the house that measures 12' x 18' with a ceiling a bit over 8' high. The room is relatively un-damped, and thus the sound of the room leans slightly toward the lively, but the furniture, thick window shades, and a fireplace are able to quell the majority of unfriendly reflections. The front end of this modest system consists of an Arcam CD player and an Oppo universal player, with an AR FM tuner from the 1970s that is used exclusively for off-axis listening, but with such a great selection of stations in our metropolitan area the music is often too tough to ignore. Two line-stage preamps were on hand, a tubed Balanced Audio Technology (BAT) VK-3iX, and a solid-state Burson Audio PRE-160. The power amps were either the tubed PrimaLunaDiaLogue Six monoblocks, or a solid-state Burson Audio PP-160, the former rated at 70 wpc, the latter 95 Wpc. I had cables built by a few manufactures available, but after only a short time it was pretty obvious that the interconnects and a single run of speaker cable made by Cardas were the best match. The power cords from all the equipment were connected to a Panamax 5510 power conditioner. The flared port on the lower part of the back of the cabinet made no noise (or chuffing, as some like to call it), at least none that I could hear, but the speakers ended up being located at least a couple of feet from the rear wall. But the distance from the rear wall wasn't nearly as important as getting my listening seat farther away from the speakers than they were spread apart. If I sat too close to the front of the speakers they lost some of their lifelike bloom, but sitting farther back allowed the sound to open up and breathe. This is not an uncommon trait, as near field listening has its place, such as when ultra-dissect the sound coming out of the speakers for professional monitoring purposes, but sitting at a greater distance from the HT1-TLs gave them a more natural, enveloping sound. The HT1-TL were designed by Salk Sound after they had been shipping the two woofer HT2-TL for a while, and they wondered "how a single woofer version of the same speaker would perform." Yes, there is a slight difference in the measurements of low frequency response that Salk provides for the HT1-TL versus the HT2-TL, the '2' reaching 3 dB lower than the the '1' (and the cabinet stands 2.5-inches taller), but in the meantime one saves a thousand bucks. I've had the opportunity to have in my home similar floor-standing two-ways from some renowned speaker makers, and like those, the HT1-TL manages to perform within the best of two worlds – the soundstage and imaging prowess of a stand-mounted speaker, and the bass of a floor-stander – yet it takes up no more floorspace than a stand-mounted speaker with the same width and depth. Not ever hearing Salk's two-woofer designed HT2-TL makes it impossible for me to judge one against the other, but the sound of the HT1-TL in my system very simply put, was tantamount to a mini-monitor with bass. This was quite an accomplishment given that that Jim Salk does not use custom drivers, nor modifies the drivers he acquires in any way, at least he doesn't mention this in any of his literature. However, it is important to note that Salk Sound uses very, very high quality drivers, and rather expensive ones to boot, but these are pretty much off-the-shelf drivers that are available to anyone. The cabinet design (not to mention their crossovers) of the HT1-TLs are a completely different matter, and their careful design has obviously yielded the type of sound that one would expect from top-notch high-end speakers, which of course includes the HT1-TL. The only thing that keeps the HT1-TL's imaging and soundstaging performance from getting the prize for best trait of this speaker is their lifelike sound of in the upper mids and treble. The relatively pricey LCY ribbon tweeter that Salk employs not only sounds smooth and lifelike, its integration into the rest of the speaker's sound is exemplary, and this no doubt due to at least in part to the crossover design of these speakers. In theory the LCY ribbon can reach down to 1.8 kHz, but the judicious use of the crossover to hand off the upper mids to the woofer at around 2.2 kHz makes the Seas 7-inch driver not only work well within its specified frequency range, but makes both drivers sound as if the sound is coming from a single point source, at least from the lowest midrange frequencies on up. Retrieval of low-level information, as well as the ambient cues that are sometimes hidden within a recording, but really shouldn't be, are excellent. Of course there were a slew of orchestral and chamber recordings on which the Salks could demonstrate their superior skill, but The Pixies album from 1989, Surfer Rosa that was recently re-released on Mobile Fidelity Sound Labs, made it clear that these speakers are champs at reproducing low level detail and ambient information. This album's recording session was led by uber-producer Steve Albini, and his use of multiple microphones placed throughout the studio to capture the instruments and voices, not only to reflect their "natural" sound, but the sound of the room in which the band was recording. The drums or individual drums on each track might have reverb or some effect on it, but by using microphones placed throughout the studio to record the drums as they sounded from across the room or in non-traditional rooms in building (such as a tile restroom) made "live in the studio" not only a term but a sound in itself. I have some experience with this myself, and trust me; it isn't as easy as it sounds because the phase relationships get all messed up without careful microphone selection and placement. This was not only done with the vocals, but guitar amps, drums and percussion, etc. to form a unique sound that makes this album an alternative-rock classic. Some have accused this album as being "lo-fi" compared with other rock and pop albums released during this time, but I think those who do fail to realize that they are hearing the actual sound of instruments and voices as they happened – or perhaps this audience is just not accustomed to hearing the sound of actual instruments on a rock album after years of hearing compressed, disingenuous (albeit attractive) sounds. The HT1-TLs handled this album superbly, bringing into the listening room the sound of the band (and the studio itself) as it was recorded. It didn't hurt that each instrument and voice on the album occupied not only its own space within the large soundstage. Special mention must go to both the lead vocals of Black Francis and the backing vocals of Kim Deal, which at times both sounded frighteningly real. The drums were also superbly reproduced, and the tweeter of these speakers especially brought the top-notch recording of the ride cymbals with a natural ping and ring. The track "Gigantic" starts off with distant rim shots, or sticks hitting the side of the snare drum, with band leader Black Francis' falsetto sounding as if he is singing from across the room, panned far to the left. When Kim Deal's unaffected lead vocals come in centered between the speakers its a bit of shock how intentionally forward and un-effected they sound, but rather than entering the room her vocals sound as if one could visualize the padded vocal booth and make an educated guess as to which brand and model microphone into which she is singing. When she doubles her vocals it does not degenerate into a smoothed-over aggregation, but each voice retains its harmonic texture. And it is beautiful to hear the harmonies she creates with herself without any studio "magic" to hide behind (which is even more evident on the following tune "River Euphrates"). When Joey Santiago's guitar enters it sounds spooky real, as if I have a sonic picture window into the recording session, his sustained tuned feedback riding behind the vocals, after which he overdubs clean guitar chords during the break that sounds as if Albini did nothing more than place a high-quality microphone in front of a small guitar amp, and let us the guitar sound stand on its own merit. "Gigantic" is my favorite tune on the album, its double entendre not withstanding, and every time I hear it I wonder why Kim Deal did not perform more lead vocal duties in this band. And I bet after hearing this song, you will agree. Orchestral and chamber recordings were able to shine through the HT1-TLs. On the SACD of the classic RCA Living Stereo collection Rhapsodies with Leopold Stowkowski conducting The Symphony Of The Air, at least during this particular listening session, the twenty-five minute overture from Wagner's "Tannhäuser" was the highlight of the disc. The basses on the right had the requisite rumble, yet never overshadowed the silky smooth strings that occupied most of the left side of the soundfield. But what was most surprising was that this multichannel disc is recorded and pressed in discreet three-track, then mixed to two via the outputs of the player. Yet, if I closed my eyes I could have easily imagine a center-channel speaker that clearly featured the winds and some of the blaring horns. These horns, some of which bled a bit through to the left and right channels had a natural blat and blare even though at their most extreme they revealed the limitations of this early stereo recording session. But the high pitched percussion of the cymbals and triangle were sonically observable as separate events, the higher pitches of the triangle's ting never being blurred with the highest frequency of the metallic sheen of the cymbals, and also in this frequency range on this recording from 1960 was the tape hiss, but still, listening to this disc was, and please pardon the cliché, as if sonically time traveling back to the recording venue. Still, these are hardly the largest speakers on which I've ever heard this disc played, and didn't have nearly the amount of bass power and transient response of these larger (and admittedly more expensive) models. And I guess the HT1-TLs' most noticeable shortcoming were their slightly wooly bass, probably at least in part due to the transmission line cabinet, but I bet that this type of cabinet design as used in the Salks have many sonic benefits other than increasing the bass' response from a relatively small driver. But hey, bass response down to the mid-30's is nothing to sneeze at, so the speakers really have nothing to apologize for. Also, even though the soundstage of these speakers was quite admirable, the images themselves were somewhat miniaturized – but this comes with the territory when listening to smaller speakers, so this is a trait of just about every small speaker I've ever heard anywhere near the price of the HT1-TLs, not to mention small speakers well above the HT1-TL's price. Thankfully every instrument and groups of instruments were drawn to scale, so again, apologies are not warranted. It goes without saying (but I'm going to say it anyway) that Salk makes many different models to fit different listening situations and price points, from a small single driver high-efficiency unit at $799 a pair to their massive Soundscape 12 which sells for about $14,000. But even so, to think that one model (or even one brand) will be to every audiophile's liking is just plain unrealistic. Yet in the room and system in which I listened to the HL-TL1s for a bit more than two months with many different types of music, at many different volume levels, and at different times of the day and night, the speakers' performance was exemplary. I highly recommend dropping Mr. Salk and company a line, either by e-mail or good ole' telephone, to discuss one's options – with the ultimate goal of receiving shipment of a pair of these fine speakers.